Zhongshan Baopass Electronic Company, founded in 1990, specializes in R&D and manufacture of various household appliances. Our products include hotel service system, lighting remote control switch, digital wireless doorbell, intelligent charger, rechargeable torch and induction switch, and so on. In order to meet customers’ need better, we have introduced advanced equipment and high-caliber and hard-working researchers and administrative staffs. 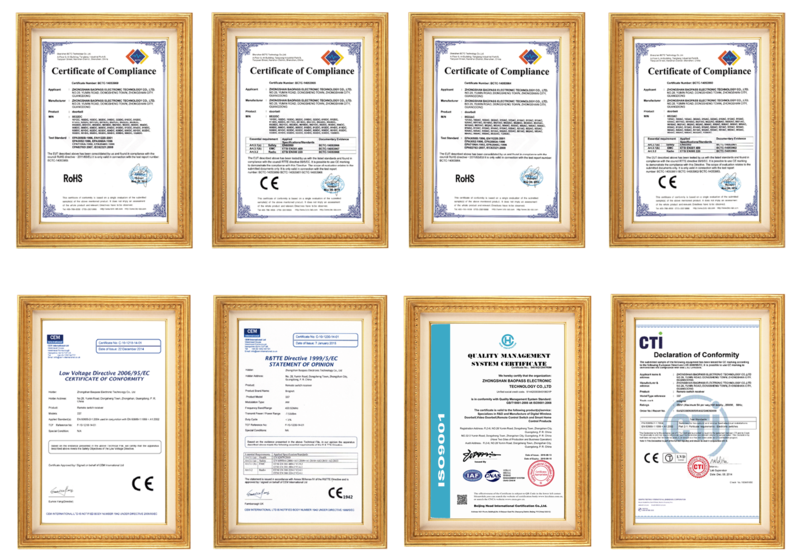 With the great effort of our staffs, our produces, passed CE approval, are safe, energy-saving and attractive. They sell well in Europe, America, Southeast Asia, Middle East and other countries and regions. “Pursuing life by quality, pursuing development by credit” is our principle. According to continuous technology innovation, we believe that we can offer higher quality products to satisfy customers’ demand. We warmly welcome customers home and abroad to cooperate with us on the basis of mutual benefit and development. satisfy requirements in different countries.